Enter I’On Village and you’ll note The Shellmore Eatery and Wine Bar has an immediate upper hand. The glass-front entrance sits on a charming tree-lined lane. Once inside, there are high tin ceilings, polished tile floors, and wooden Parisienne chairs, lending to an ambience that is at once airy, cozy, and loud AF. In Paris, the vibe and volume is part of the appeal. Here? Well, prior to this, I can’t remember the last time I actually screamed at someone in an effort to be heard. Shellmore’s menu is tiny, featuring fresh oysters and four or five small plates that rotate nightly. The offerings range from arugula and apple salad, to steak tartare ($13), the latter of which was available on both of my visits. 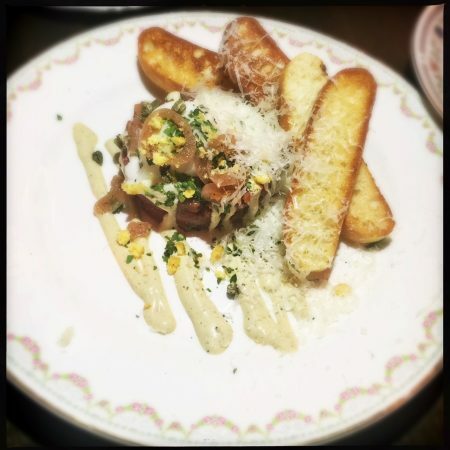 The contemporary remix featured the traditional cubed, raw beef, plus fried capers and an arty smear of dijon mustard. Thinly sliced pickled red onions and a firm sous vide egg wink at tradition, while fresh oregano adds a pungent, earthy element. Served with three, thin-toasted slices of baguette, it’s at once progressive and sentimental. Emphatically comforting, the rich and homey beef and pork ragu ($18) was dotted with pine nuts and fresh basil leaves. 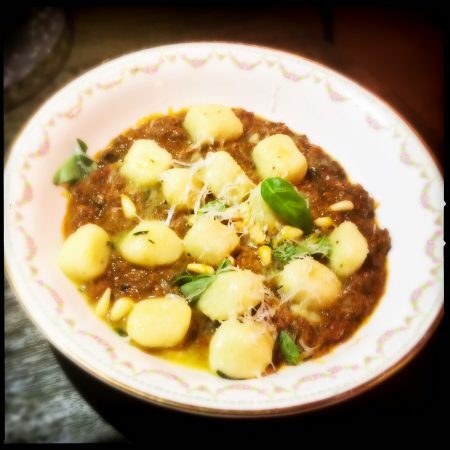 Although unquestionably lovely, it’s the delicate cubes of pillowy homemade gnocchi that elevated what could be simply nostalgic into an elegant and graceful memory. But as much as there are highlights at Shellmore, there are some baffling blunders, like a bitter shrimp ceviche ($14) cured with mango, lime, and lemon juices. The generous scoop of tiny shrimp were mixed with cilantro and pungent, overpowering scallion slices. 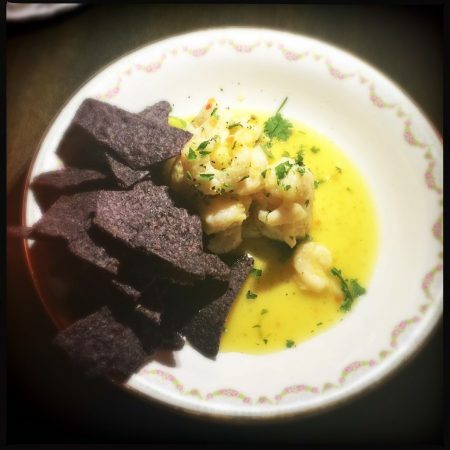 Served with thick blue corn chips, it feels like the start of something special, somehow abandoned mid-execution. Perhaps this is just a reflection of the clear state of overwhelm in the kitchen, as the pace of the dishes started slowly and crept to a stall so lengthy that free wine and even — eventually — additional food was brought to the table without comment. “What you ought to do is wander back there like you’re looking for the bathroom and then try to figure out what’s going on,” suggested my hungry dining companion, while gesturing toward the kitchen. The front of the house is run by just two people and at times their concise, soldier-like efficiency approaches disdain. It’s hard to blame them, however, as the volume level on a busy night is enough to put a Zen master on edge. 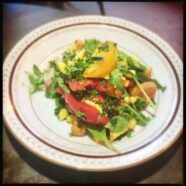 Meanwhile, a clunky corn and tomato salad ($10) included overripe red and yellow tomato slices, plus indestructible croutons tossed with fresh parsley, vibrant arugula, and a powerfully garlicky vinaigrette. Vampires and bad breath-a-phobes take note: This ain’t no fooling around. 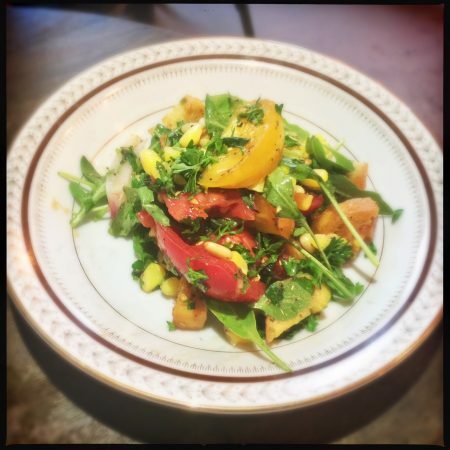 Although likely delightful at the peak of the summer, in early October, chasing individual kernels of yellow corn around a plate filled with mushy tomatoes feels notably out of season. 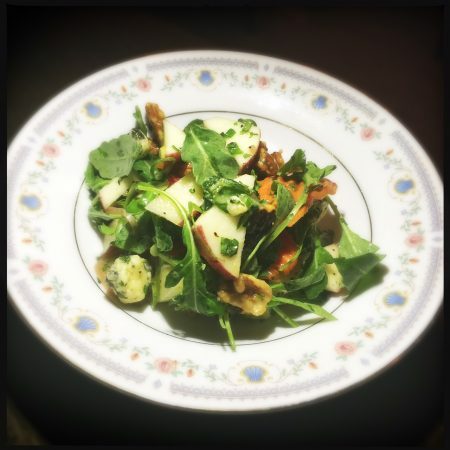 In happy, memorable contrast, the apples, blue cheese, and arugula salad ($10) served just one week later was a spot-on celebration of autumn bounty. Tossed with candied walnuts, pickled carrots and a touch of mint, this was a bright, piquant dish rendered sumptuous by copious dots of rich blue cheese. There are less than 20 wines offered by the glass ($8-$17), with three rosés, a cava, and a Syrah blend making the list. As my wine expert dining companion noted, “A wine bar offering 18 choices is like an ice cream shop with five flavors.” There’s also a lack of options with regard to pour size, nor an opportunity to taste before committing. The less-seasoned among us — present company included — will have to decide whether the words “bright acidity” or “delicate and floral” are more appealing. 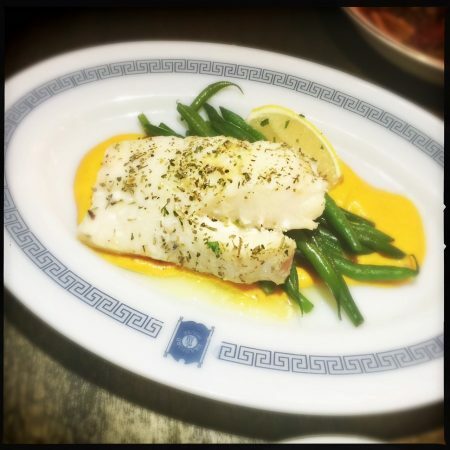 It must be noted that the butter roasted cod ($19) was an exercise in both patience and technique. Roughly an hour and a half from ordering to appearance, it was also a beautiful, elegant dish. The finished product fell nothing short of sublime. Plated on delicate, tarragon-infused whipped sweet potato purée and toothy haricot vert, it’s heaven, so long as you have a couple hours to spare/drool in anticipation. No doubt the place for I’On residents to go and talk about friends and neighbors in volume-cloaked anonymity, The Shellmore is a promising spot to enjoy some wine and sample a few small plates. And if you happen to have a huge amount of time on your hands? All the better.